The setting is a small Columbian church where the poor are fed daily and everything appears peachy, isn’t that always the case? Our protagonist is a hunchback called Tancredo who works as a priest’s acolyte in the hope of one day going to university but Father Almeida who rules all beneath him, has a firm grip on everyone and is unlikely to let go any time soon. We don’t learn a good deal about the protagonist as there is never much time to do so in a novella but what we do know is that he grew up in the church as a form of ‘charity case’ and is petrified of becoming an animal. Becoming an animal in Tancredo’s eyes lays within his fear of succumbing to carnal pleasures with Sabina, the sacristan’s god-daughter which he does- consistently and possibly an all too common occurrence in an office setting. Father Almeida works everyone to the bone, all in the name of God of course, even the three elderly lilas have had enough as they cook day in day out for the masses of needy that come tumbling through their door thanks to Father Almeida. For one of the lilas, the loss of an index finger in the pursuit of cooking for the needy does not warrant any real complaint, until now that is, for it is only a matter of time for those around Father Almeida to open their eyes and take matters into their own hands. The turning point comes in the guise of a stand in priest; the singing, jolly drink-inclined Father Matamoros who changes everything in a matter of hours as if by magic. 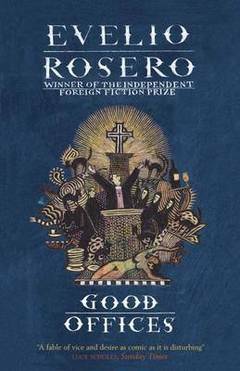 With its dark satirical undertones and comical references in which the Three Graces- like characters go through a metamorphosis turning them into Macbeth’s “three witches”, Rosero’s novella doesn’t truly satisfy the reader’s thirst. It’s a tale of morality which demonstrates the fickleness of human beings and narrow boundaries, yet its didactic manner somehow falls short. The reader cares very little for its protagonist or the highly emotional Sabina who seems to be constantly on the verge of hysterics. What’s more obvious is the fact that it is no longer a surprise when sinful goings on take place in the house of God.